The High Frequency Active Auroral Research Program (HAARP) isn't your grandfather's HAM radio. Although this 3.6 million watt radio transmitter is best known for its ability to create ELF waves to signal submarines, HAARP is also used as a radio telescope to probe our Moon, Sun, coronal mass ejections, comets, and other space phenomena. The interaction of high-power radio waves with the ionospheric can produce faint optical emissions at specific wavelengths. 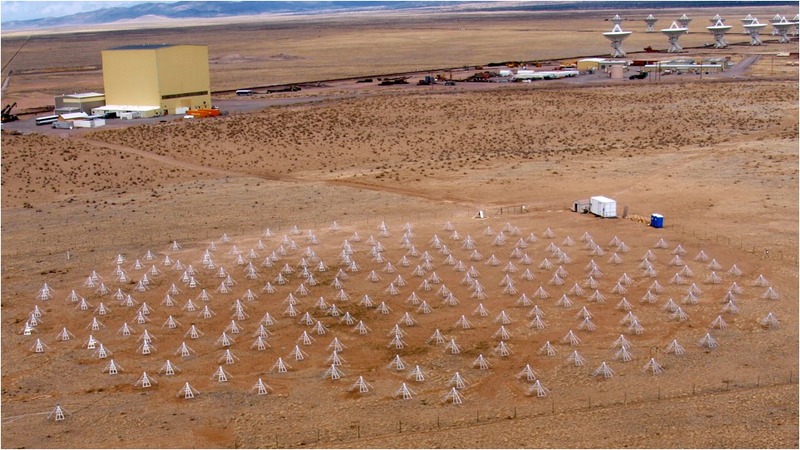 Recent experiments at the HAARP Gakona Facility investigated the role of the HF beam pointing direction on the production of artificial airglow. The exciting result was that by pointing the HF beam directly along a geomagnetic field line, artificial emissions of greater than 200 Rayleighs (R) at 630.0 nm and greater than 50 R at 557.7 nm could be produced. This intensity was nearly an order of magnitude larger than that produced by heating directly overhead. Weak emissions of approximately 10 R were observed with effective radiated power (ERP) levels as low as 2 MW. 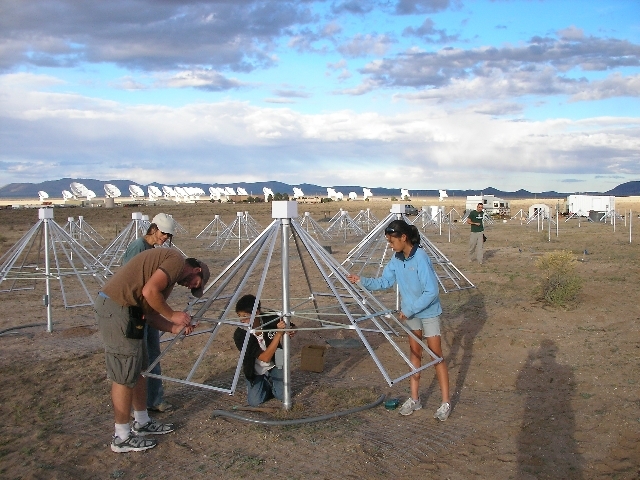 These measurements have been repeated in other research campaigns with observations over a wide range of ionospheric conditions. In a bistatic configuration, HAARP directs signals at heavenly bodies and a secondary site, usually a receiving antenna array, receives echos from these broadcasts. 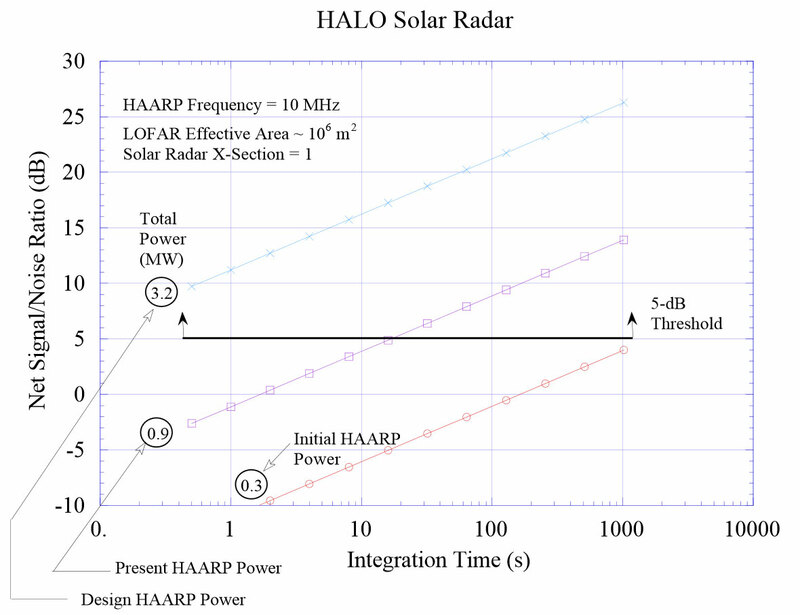 In the following research projects we will see HAARP team up with the Long Wavelength Array (LWA) in New Mexico, the NASA WIND satellite (HAARP-WIND), and the Low Frequency Array LOFAR (HALO). A specific example of a recent experiment is given in Fig. 3 .and WIND spacecraft on September 13, 2001, when the :spacecraft was approaching the Moon to use lunar gravity for orbit perturbation. In a 2-hr interval, when the spacecraft was about 40,000 km from the lunar surface, the HAARP array illuminated the Moon with a series of 100-ms pulses at 960 kilowatts at a frequency of 8.075 MHz. Check out HAARP and the Sky Heaters, as well as the LOFAR Array on ClimateViewer Mobile and ClimateViewer 3D! HAARP, HALO, and Celestial Resonations by Jim Lee is licensed under a Creative Commons Attribution-NonCommercial-ShareAlike 4.0 International License. Based on a work at climateviewer.com/. Permissions beyond the scope of this license may be available at climateviewer.com/terms.